Zhu Ke Cha - literally translated as bamboo wrapped tea is actually a black tea compressed to small balls and wrapped with the outer cover of a bamboo stem. One 'tube' get you five balls of this tea, and one of these balls weighing about 3.5g is sufficient to brew up a litre of strong herbal tea. Zhu Ke tea comes from Guangdong, China and it had been around for many years. A very inexpensive tea, these tubes are commonly sold in Chinese medicinal shops, tea shops and even Chinese grocery shops. Though this tea is a black tea, many Chinese regarded this tea as a herbal tea due to its medicinal aroma. Many Chinese today brew this tea to drink when one feels 'heaty' or is down with a flu. I was told that during the major bird-flu crises that affect South East Asia and Hong Kong from Nov 2002 to July 2003, there was a high demand for Zhu Ke tea that it became a hard-to-find item during that period. You will have noticed, from the above pix, that this tea is hand wrapped and looked really 'artisanal'. The compression of the tea balls are not high, and you can break up the ball without much effort. I used a porcelain teapot to brew this tea. Porcelain teapots are good to brew all types of tea as a good detergent washing of this teapot would remove all the aroma and residue, leaving the teapot ready for brewing another tea. I presently reserved my clay teapots for pu erh and oolongs. I could make 3 good teapots of zhu ke tea from one ball. I estimated that I got about 1 litre of tea from this tea session. This tea has strong aromas of wood. I thought there was a pinewood scent in the tea as well. Tea absorbs scents easily and this zhu ke cha had 'absorbed' the scent of the bamboo husk wrapper. The combination of black tea together with the scent of woody bamboo makes for a nice 'herbal' drink. I particularly like to drink this tea hot than letting it cool down to room temperature. I purchased this Taetea (aka Dayi) ripe pu erh in a KL tea expo back in 2011 (link). One of this red tin hold 5 individually wrapped pu erh cakes. One cake is 150g so you are getting 750g of ripe pu erh tea in a tin. Information about the tea can be found on the tin. The tea is composed of ripe pu erh tea that was already 3 years old. This would imply that that this tea had 'aged' for 3 years and the tea would be very drinkable and not have the wodui taste of newly made pu erh that need to mellow out in a couple of years. Opening this tea today would mean I am drinking a 8 year old Dayi ripe tea. I had noticed big brands like Dayi and Haiwan are now selling their new ripe pu erh that are made or mixed with 'older' ripe tea. It does make business sense as new tea collectors and drinkers can actually enjoy drinking (immediately) when they buy these new tea. 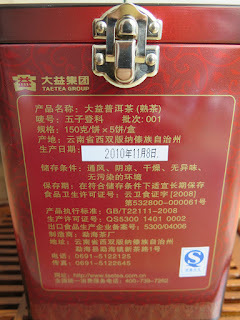 It is uncommon that pu erh is manufactured and packaged in tins. Tins are more expensive when compared to bamboo or paper wrappers. Selling pu erh in tins could mean the tea is a special or limited edition production. Haiwan had also produced premium tinned versions of pu erh tea for sale as well. These Haiwan tins hold a single 600g brick, with small holes punched on the sides of the tin to allow air circulation. I will write a blog on this Haiwan tea soon. This cake, as you would have observed from the pix, is made up of smaller pu erh leaves. The tea leaves are really small. I am not fond of brewing with small tea leaves as they tend to 'clog up' my teapot. Tea tends to pour out much slower after being 'clogged' and the result may be a much stronger brew than expected. Dayi ripe tea, based on my experience, brews fast and strong. This tea is no different and I would recommend, when you are brewing this tea, to reduce your tea leaves by 30-40%. Even with this reduction, the tea brews strong and could get me 10 very good infusions from one tea session. The tea exhibited nice aroma and taste with a very smooth, creamy-like finish. An excellent after dinner tea. A few friends from overseas visited me last week and I decided to brew up this tea for that occasion. Ti Kuan Yin (sometimes spelled as Tie Guan Yin) or TGY for short is a very popular oolong tea produced in Fujian, China. Bao Ding brand sells their 250g tgy in a tin. You will observed that this tgy is medium roasted and the tea leaves are rolled as seen. I decided to brew this tea 'dim sum restaurant' style. I used a 90s deep red 'wan shou' porcelain teapot for this tea session. I scooped out 3 tablespoons of tgy, then pour hot water filling 3/4 of the teapot, and refilling the teapot with hot water when the tea had poured out. No rinsing of tea and the steeping times of the tea were more prolonged and leisurely…….and I could get 3 teapots of tea. I normally prefer my tgy to be heavy roasted but this Bao Ding version was pleasant. It had a delightful floral character, with subtle hints of a Taiwanese high mountain tea. An inexpensive tea. This tea, by the way also makes a very nice chilled oolong as well.